A very Miffy Birthday: Miss T is Five! Earlier in April, Miss T turned 5 but with recent events, including her hospital stay with Chicken pox complications due to the Methotrexate she takes for Juvenile Arthritis, I hadn't got around to writing up her birthday blogpost. She'd asked for a Miffy birthday cake. She knows what Miffy's birthday dress looks like so we knew it had to feature Miffy in her birthday dress but that is as far as we had planned it until we got to decorating it. Miss T helped to decorate. She used a flower cutter to cut out the white flowers for Miffy's dress and the colourful flowers to go on the grass. I covered the cake board in yellow fondant icing to give it a bright background. And the grass piped around the bottom of the cake is green buttercream and piped with a grass nozzle that I bought last year for D's blue bear cupcake 'fur'. She was delighted with her cake. And because she had helped to make it - she announced to all her friends that she made it 'all by herself with a little help from mummy'. Hmmn. We couldn't face having a big party, so she just had her 'besties' round for a mini-cookery class. They made pizzas to have for lunch as well as cupcakes, chocolate popcorn, chocolate nests and chocolate truffles. Big brother D was away with his church group for the weekend, which always seems to coincide with Miss T's birthday weekend. But she had a helping hand from biggest brother J to open presents. At five years old she remains utterly delightful as she has been from the moment she was born. She's helpful, caring and says the cutest funniest things sometimes. She's learning to read and loves writing shopping lists. As well as being into Miffy big time (she keeps asking to go back to the Miffy museum we visited on our visit to Amsterdam last October), she also adores Star Wars and has recently got into Harry Potter given that D really loves Harry Potter. She oozes confidence with singing and dancing and bossing us around when playing teachers. A far cry from when she lost some of her confidence when her arthritis was first diagnosed and she found herself unable to walk or do many of the things she used to do. We're so proud of how she settled so well into school last September despite having disrupted days due to medical appointments and days off unwell being more common for her due to her suppressed immune system. Five years old. May your year be filled with wonderfulness Miss T. Happy Birthday. Brilliant Blooming Breakfast Smoothie bowl with Vita Coco Coconut Milk Alternative. Breakfast is the meal of the day that I can get stuck in a rut with and since going largely dairy and gluten-free since last year, I've been trying to ensure that I have a bit of variety at breakfast time so I'm always keen to give new ingredients and recipes a go. Already a fan of Vita Coco coconut oil in my cooking and baking, I couldn't wait to try their Coconut Milk Alternative. It's made with 70% coconut and so it #TastesLikeNoUdder. Before I get to my breakfast recipe that I made with Vita Coco Coconut Milk Alternative, I have a confession to make...I tasted a sip and then began to drink it. Lots of it. It tasted soooo good just on it's own. So I had to stop myself drinking it all so that I could make my "Brilliant Blooming Breakfast Smoothie Bowl" that is packed with goodness. (optional) superfood style powders - I used half a teaspoon of baobab and half a teaspoon of a superfood powder mix containing pea protein, maca, chlorella and camu camu - This is totally optional as the smoothie bowl will still taste and look awesome without these if they are tricky to get hold of. 1 or 2 chunks of banana for extra natural sweetness if desired. (you can get creative here and choose all sorts of nuts, seeds, fresh or dried fruits to get your smoothie bowl looking and tasting great). 1. Start by preparing a mango rose that will be used on top of your smoothie bowl. I've always wanted to have a go at making one and this was actually my first attempt at making one. Well technically second attempt but today was the first time I made one. You can find a plethora of You Tube videos showing you how and although they do make it look easier than it is, I think with practice it will get easier. So at this stage, peel and cut your mango into very thin slices. Don't attempt to make the rose yet as I found leaving the mango for a short while helped it become juicier and 'stick' together better as a rose when I got to that stage. 2. Pop your oats, chia seeds and flaxseed into a blender and blitz for a few seconds to break up the seeds and make the oats finer. I love adding oats to my smoothie bowls as I find it makes it a more filling breakfast to keep me going for the morning. Oats are nutritious and contain Beta-Glucan, a soluble fibre. They are also believed to lower cholesterol levels. Chia seeds offer a whole host of nutritional benefits and contain Omega 3s. Flaxseed is another great source of plant Omega 3s and contain both types of fibre as well as having antioxidant properties. So we're already off to a great start with the smoothie bowl. 3. Next add in any 'superfood' style powders you wish to - I used half a tsp of Baobab powder and half a tsp of a powder mix containing pea protein and maca amongst other things. This step is entirely optional but as I had these ingredients in my store cupboard, I like to add a bit to any smoothies I make for added goodness. Baobab powder for example is high in Vitamin C and is a rich source of fibre and antioxidants. It contributes to normal immune function, energy release and healthy, glowing skin. I love it because it has a great taste too! 4. Pop in the berries into the blender. Frozen work just as well if your favourite berries are out of season. I love the gorgeous purple colour that this combination of berries gives. 5. 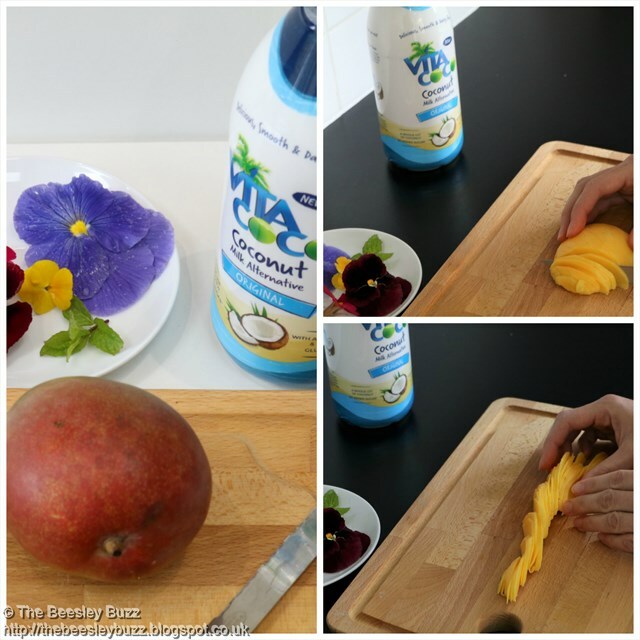 Add 200ml of Vita Coco Coconut Milk Alternative and blend everything together. If you want to make it a little sweeter then a couple of chunks of banana will do the trick. Coconuts are super nutritious and packed with vitamins and minerals. This Coconut Milk Alternative from Vita Coco is gluten-free, dairy-free and has no added sugar. I found that it tastes great on it's own too! 7. I made my mango rose and carefully lifted it onto the centre of my smoothie bowl. I wanted to stick with the flower theme (hence naming it 'Brilliant Blooming Breakfast Smoothie bowl') so used some edible flowers from the garden. I used pansies, violas, primroses, pinks/dianthus, and a little sprig of mint. Some of the flowers were placed clustered together and some of the petals were placed around the mango rose. 8. Then I added the pumpkin seeds making a pattern around the mango rose. Finally I sprinkled cacao nibs (rich in anti-oxidants due to the phytonutrients in them) around the edge of the bowl. Some of my other favourite toppings which I sometimes use in smoothie bowls are cacao powder, roasted chopped hazelnuts, pistachio nuts and additional berries. All of these would have also worked well. I was really pleased with how it turned out and I'm sure the Vita Coco Coconut Milk Alternative helped it taste extra smooth and delicious compared to the normal milk alternatives that I sometimes use. Easter has come and gone and yet here I am writing up an Easter cake recipe. Why? Our family Easter had to be postponed this year. On Saturday evening we noticed a few spots on Miss T and as we'd always been told that contracting chickenpox whilst on her methotrexate injections would be dangerous for her, we phoned the hospital ward and they asked her to go in and stay overnight. Fast forward another 5 nights and she was still there having missed roast dinner and the annual Easter egg hunt that has become tradition at granny and grandads house. She's not even had much of an appetite for chocolate so hasn't yet eaten the chocolate egg that the nurses gave her in hospital. She's been on acyclovir intravenously to help her fight the chickenpox which her immunosuppressed body would be unable to do unaided. I did the usual thing I do in a crisis when I am feeling stressed - I've baked! It takes my mind off things as I need to concentrate to avoid my typical baking disasters and I've pottered in the garden planting up some bright spring flowers for Miss T to enjoy when she got home. I also wanted to bake something really special - an Easter cake made especially for Miss T to celebrate her getting out of hospital so that we can celebrate our postponed Easter. I was inspired originally by the idea of a simnel cake ever since seeing it on Mary Berry's Easter Feast last year, but I knew Miss T isn't a massive fan of fruit cake. So I used the melted marzipan layer as my starting point for deciding upon this cake. I love lemon and poppy seed cakes - they remind me of springtime and it's lighter than a fruitcake so decided to use that as my main cake batter but added in a few twists...saffron which I love and reminds me of my cultural heritage with my late mum being Persian, a small amount of dried fruit to give a nod to the classic Easter simnel fruit cake and some chopped crystallised stem ginger - simply because I had bought some ages ago and never been brave enough to use it in any cooking. I initially wanted to decorate it in a fun childlike fun way with bunnies and eggs to appeal to Miss T but as I baked and decorated things just evolved to give me the cake I ended up with. In many ways simpler than I had planned but I feel more fitting to what Easter means to our family. Easter is a special time for me because I was baptised as an adult 15 years ago at an open-air dawn service on Easter Sunday. Whereas Christmas can easily become an over-commercialised present-frenzy, Easter feels like a simpler time of year - a time for reflection as well as a time for celebration and renewed hope. I baked it in my heart shaped silicone cake tin to represent that this is a labour of love for my little girl that I've missed so much, and also reflecting God's love for us at Easter time. I wanted to include the 11 marzipan balls to represent the 11 disciples (minus Judas) and I knew I wanted to include some edible flowers from the garden and Miss T adores flowers. Miss T was allowed home from hospital today. Her consultant agreed for her to move onto oral acyclovir for the next 7 days of treatment which means she no longer needs to have the drip, which means she can be at home - hurrah! 1. Pre-heat the oven to 180C and grease a cake tin. 2. Mix together the caster sugar, butter/margarine, eggs and self-raising flour. 3. Add in the poppy seeds, saffron, lemon juice and zest, ginger and dried fruit (you can toss the dried fruit in a little flour first to prevent it from sinking inside the cake). 4. Pour half of the cake batter into the cake tin. 5. Break the marzipan into two roughly equal pieces - one can be slightly larger than the other. Using the smaller half, roll until thin and cut to the shape of your cake tin. Place into the cake tin on top of the cake batter. 6. Add the remaining cake batter on top of the marzipan. 7. Place in the oven and cook for approximately 50-60 minutes until a skewer comes out clean. Mine needed 35 minutes at 180C and then I lowered the temperature to 170C for a further 25-30 minutes. 9. Once cool, remove from the tin and brush the top with apricot jam mixed with a little boiled water to loosen it. Then roll out your second piece of marzipan, cut to shape and place on top. Using the remaining pieces of marzipan from the off-cuts, make 11 small marzipan balls and place on the cake. 10. Brush the marzipan with a little beaten egg and place the cake under a hot grill for a couple of minutes to slightly brown the marzipan. 11. Once cooled down again, decorate using edible flowers. I used pansies, violas, primroses, and pinks (dianthus) from the garden. I also added a little rosemary for a splash of greenery. Having tasted a crumb that fell off the cake, I was worried it was too dry, but when served a slice of cake with the marzipan melted in the middle, it was perfectly moist enough. There was just the right amount of poppy seed for that satisfying crunch and the saffron fragrance permeated through the house as this cake cooked. It's been so lovely having Miss T home this evening and I was so pleased that she loved her cake. Here's hoping for a less eventful Easter next year! Linking up to Mummy Mishaps. Sometimes I'm tidying the kids bedrooms and come across something that makes me stop and smile. Equally sometimes I find things that make me go 'ugh gross' like smelly socks they'd stuffed behind the cupboard instead of putting in the wash! 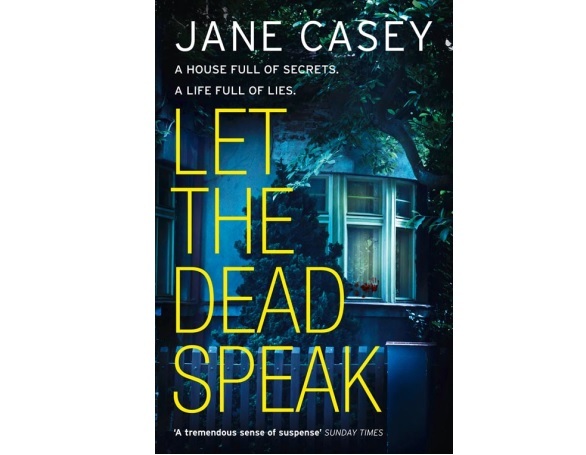 Let The Dead Speak is the latest novel by Jane Casey featuring Detective Sergeant Maeve Kerrigan. Although the seventh Kerrigan story, I haven't read the previous ones and can honestly say this works brilliantly as a standalone book. When eighteen-year-old Chloe Emery returns home early one Sunday she finds what nobody would ever want to see. Blood - splattered across the floor, over the ceiling, splashed down the walls. And her mother, missing. Whilst Chloe, who has learning difficulties, appears to not understand what has happened it quickly becomes apparent that everyone has secrets. It is down to DS Kerrigan and her colleagues to piece together the sparse and twisted evidence to try to find out what has happened, and who is responsible. As the lies build, the path to truth becomes more difficult and convoluted. Chloe refuses to talk to the police, but it seems her friend is protecting her. Her father knows nothing, and her step-mother is far from helpful. The neighbours cannot or will not say anything. Some secrets, it seems, are too terrible to share. Whilst this is the first Kerrigan story I've read, I really enjoyed it and wasn't hindered by not knowing the previous tales. The book is fast-paced and, despite the gruesome details necessarily contained within it, it's an easy-read. Brilliantly-pitched to avoid police cliches or jargon, whilst ensuring all the basics of forensic police work are covered. Readers are encouraged to instantly dislike certain characters - but the truth of whether that is fair or not is only revealed much later on in the story. The book is full of secrets, and as each is revealed we are drawn down a certain path for a few pages before the story twists and turns down a different route again. Truly captivating stuff, I couldn't put the book down until it was over... A great read, and I will certainly be keeping an eye out for other Kerrigan novels by Jane Casey. Let The Dead Speak, by Jane Casey, is published by Harper Collins and can be purchased direct from them or from Amazon. “I am a member of the Mumsnet Bloggers Panel, a group of parent bloggers who have volunteered to review products, services, events and brands for Mumsnet. I have not paid for the product. I have editorial control and retain full editorial integrity.”. This post contains an Affiliate link which means that at no cost to you, I may receive a small payment if you buy something from a site I link to. I only recommend and link to products, services and companies that I am happy to promote. There's no such thing as a free lunch but there is FREE Tennis! Last summer we signed up for a tennis session with the Lawn Tennis Association's Great British Tennis Weekend. Miss T and D had a whale of a time in their session and we were really impressed by how geared up for kids the session was. Miss T has repeatedly asked to do tennis again since then but we just had not got around to looking into it. And then we heard about another great initiative by the Lawn Tennis Association. FREE tennis sessions for kids aged 5-8. It's Miss T's 5th birthday next week and so she'd be the perfect age to take part. What's even better than FREE tennis? Free tennis sessions PLUS getting a FREE tennis racket to keep at the end of the course. How amazing! And they're open to anyone aged 5-8. We found a club close by and have signed her up for a series of 6 #TennisForKids sessions. There were various venues and session times listed on the Clubspark website where you can easily book online. The process was so simple and took just a matter of minutes and she was fully booked onto a course. I love that the #TennisForKids sessions are specifically tailored for a specific age group (5-8) and it seems they've thought of everything from having softer balls for beginners, ball games to help hand-eye coordination and build confidence, holding sessions on mini-tennis courts so that kids find it more manageable. The coaches are trained in getting young kids excited about tennis making it a really fun experience! I don't think Miss T will have any problems getting excited because when we broke the news to her she ran outside with Daddy's tennis racket and ball for a quick practice. The sessions start from 22nd April (Miss T is booked onto a course starting in May) and there are a whopping 20,000 places available across the country. Completely free of charge! And a free racket to keep too! Is there anything left to stop you booking onto a course right now? Thought not. So if you have a 5-8 year old who would like to give tennis a try (and get a free racket to keep), whether they are a total beginner or have already played tennis before, then head over to the Clubspark LTA website and book them onto a course now. (Quick before all the places are gone.) Go Go Go! Disclosure: I’m working in a paid relationship with the Lawn Tennis Association on their #TennisForKids campaign. Sign up for your FREE tennis activity here. It's LEGO. It's Disney Marvel. It's Guardians of the Galaxy. What's not to like? Our household is getting excited. Guardians of the Galaxy Vol. 2 is released on 28 April starring big names including Chris Pratt , Zoe Saldana, Vin Diesel, and Bradley Cooper. To celebrate the release Disney have launched a range of new products - plush toys, mugs, costumes and, of course, LEGO! The lovely people at Disney sent us a Ravager Attack set of the Marvel Superheroes, Guardians of the Galaxy (Volume 2), and we set 11-year old D the task of building it. With a freshly-broken arm after his latest battle with his bike, I wasn't sure he would be able to take on this challenge... but I was wrong! D loves LEGO. So do I. So I admit I was a little disappointed that he didn't ask me for help. But he really enjoyed building the Taserface's M ship, and it was great to see him overcome his own physical challenge to complete the build alone. This Ravager Attack set (76079) is designed for 6-12 year olds, and D found that age bracket was right. 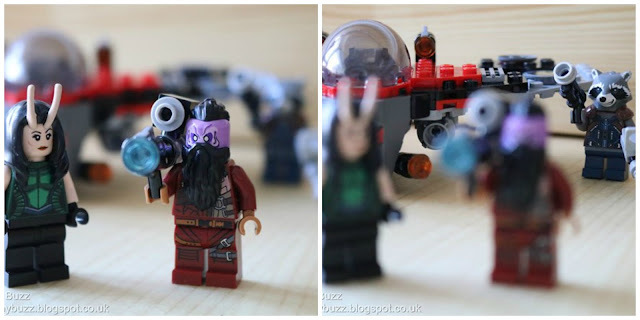 The instructions were really clear, and he took no time to build the M ship, the tree, six-stud shooter and characters (Taserface, Mantis and Rocket are included). It wasn't until the build was over that I found out that the six-stud shooter fires up to six shots, and the M ship is equipped with stud shooters. Yes, I became the target. Thankfully the set comes with quite a few spare studs to help replace any temporarily lost in battle. The set comes with a short comic featuring the items in the set. As D is a big comic fan, this was a nice little extra. We completely love this set, and it has already entered battle in D's room. So, if you've a fan of LEGO, Marvel, Guardians of the Galaxy or comics in your household, grab the Ravager Attack set... then take cover from the stud shooters! You can buy the Lego Marvel Super Heroes - Guardians of the Galaxy 2: Ravager Attack set from Amazon here. Also available from Disney and other online retailers. Disclosure: We were sent the LEGO Marvel Guardians of the Galaxy Vol 2 set for the purposes of review. All opnions are our own. This post contains an Affiliate link which means that at no cost to you, I may receive a small payment if you buy something from a site I link to. I only recommend and link to products, services and companies that I am happy to promote. I hadn't read "Flawed", Cecelia Ahern's bestselling debut novel. But I was keen to read this sequel. The basic premise of it, humans being able to judge other humans as 'flawed' if they don't live up to the standards of the morality court, reminded me of Max Lucado's book for young children 'You are Special' where the Wemmicks judge each other and stick dots and star stickers as they see fit. In Ahern's book, the punishment structure is rather more severe with the "flawed" being branded with hot irons in the shape of an 'F'. And the heroine at the centre of the story is the immediately likeable Celestine North. Her traits of care, kindness, compassion and wanting true justice make her seemingly the least likely candidate for a 'flawed' branding. And yet here she finds herself on the run, not knowing who to turn to or who she can trust. Full of twists and turns, this gripping novel had me turning the pages to know if Celestine succeeds in saving not only herself but all of the Flawed. Whilst we'd all like to think that we are reasonably good people and would never do anything do be branded flawed ourselves, in this novel, things aren't so clear cut. I took the Perfect/Flawed test with these simple questions on this quiz and was shocked to find myself 60% Flawed. A sentence of 2 brands would be my punishment in Celestine's world where she is fighting to bring true justice which holds compassion and logic at it's core. Richard fared even worse in this world which has lost sight of what is truly right and wrong. His morality score came out at a mere 10% with a sentence of 5 brands! Yet he is the most honest person with the greatest integrity that I've ever known. Having read the book, I'd rather be 'flawed' than 'perfect'. Whether you've read the original Flawed book or not, Perfect is a gripping read which works in its own right. You can buy a copy of Perfect here. Disclosure: We were sent a copy of Perfect for the purpose of review. A small fee will also be paid for our time. Miss T adores Aquabeads. Ever since her godmother gave her a playset for her birthday last year, she's been totally hooked on these little colourful beads that magically stick together with a spray of water. So you can imagine her excitement and delight when Aquabeads sent her the Finding Dory Aquabeads Playset to review. The set came with a bead palette to store the beads, a design table (which also doubles up as a clip on cover to keep the beads safe when not in use), a layout tray where the beads are placed onto, 3 template sheets which help you form the Dory / Nemo themed designs, a sprayer for squirting the water on and a bead pen. One of the things we've noticed about Aquabeads is that they seem to be continually looking at little ways to innovate and improve. For example, of the 3 sets that we own, each of the design tables clip onto the bead palette in a slightly different way. Indicating that Aquabeads are always improving on the design. Similarly the bead pen that was included in this set is different to the other bead pen that we have. This one can store several beads in it whereas the previous one is for picking up and placing one bead at a time. Miss T did actually find the previous style bead pen easier to use but that may change with practice. Now here's the interesting thing that happened with Miss T. She loves Aquabeads. She often asks to get her Aquabeads playsets out. So she started working on a Marlin and Nemo design straight away. Then she took a break from it for a few days. Then she decided she didn't want to carry on with it so we packed it all away. The following day, she wanted to play with the Aquabeads playset again. She once again chose the Nemo design to work on. She concentrated hard and put the beads in place. Then took a break. The following day, she did some more. She loves the satisfaction of finding the right colour beads, choosing which beads to use next and getting them in the right places. Then she took another break. This time after asking her if she wanted to carry on, she said she wanted to pack it away for now. So the beads were put back in the tray and I have no doubt she will again get them out next time she wants to play Aquabeads. Now the dilemma I faced and had to bite my lip about was that grown-ups often only value things that are finished, complete, finalised. So as much as I wanted to just place the final few beads on and spray it with water so that it was 'done', I had to resist that urge and respect the fact that Miss T is getting a huge amount of enjoyment from the process rather than feeling the need to get an end product out of it. As I write this blogpost, I don't have a finished Marlin to show you, nor a Nemo or a Dory or Hank the Octopus. But I don't mind and I hope you don't too because Miss T has enjoyed the Finding Dory Aquabeads playset regardless and I'm sure she will continue to do so. You can buy the Aquabeads Finding Dory Playset from Amazon and other good toy retailers. Disclosure: As official Aquabeaders, we were sent the Finding Dory Playset for the purposes of review. All opinions are our own. This post contains an Affiliate link which means that at no cost to you, I may receive a small payment if you buy something from a site I link to. I only recommend and link to products, services and companies that I am happy to promote.